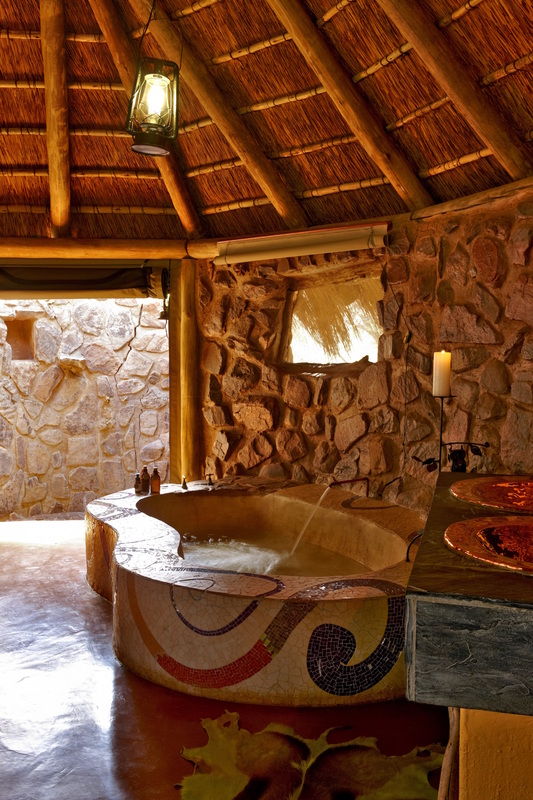 Inspired by the unique natural surroundings, and designed with comfort and relaxation in mind, the accommodation options at Jaci’s Safari Lodge offer guests the ideal base from which to experience their own African safari. 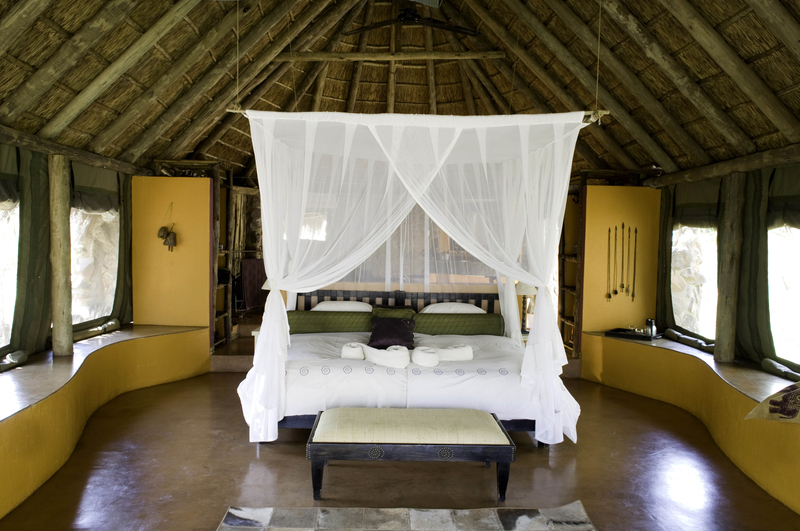 With thatched roofs, low stone walls, suspended viewing decks and canvas roll-up panels, the six spacious tented suites let the outside in. 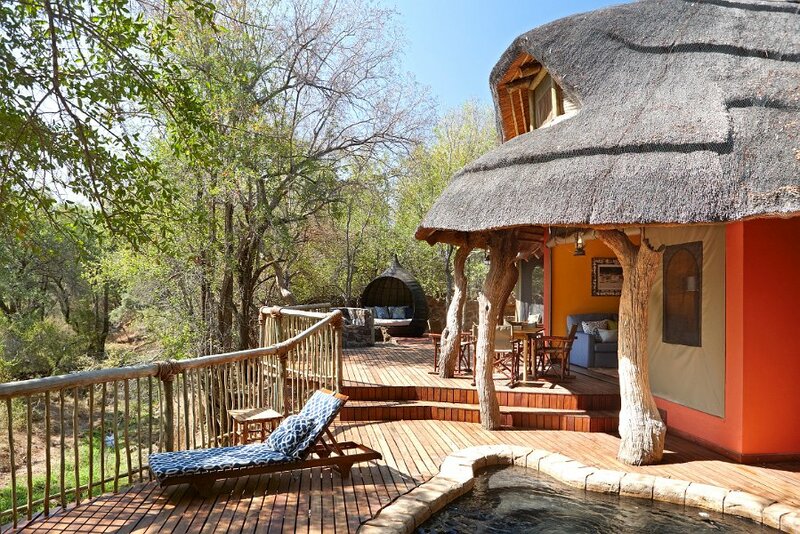 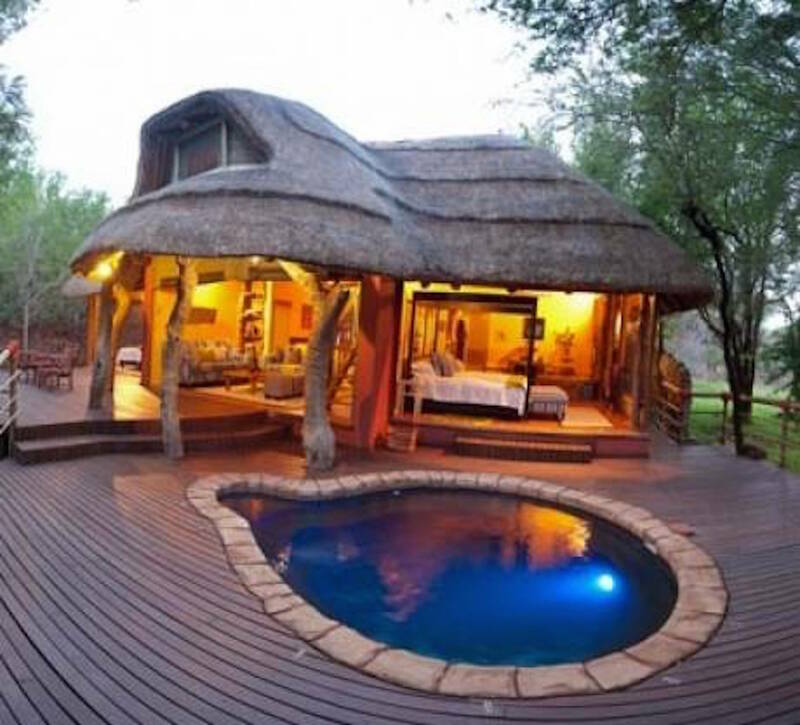 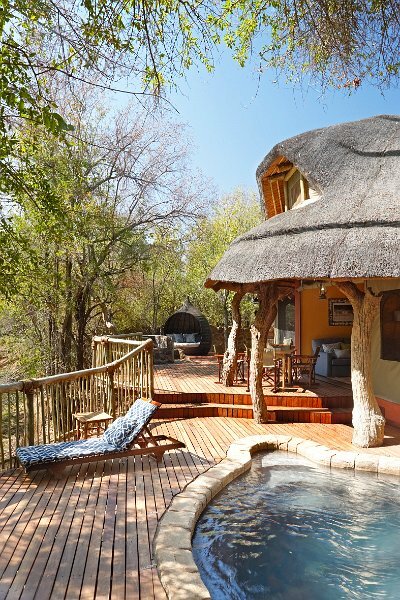 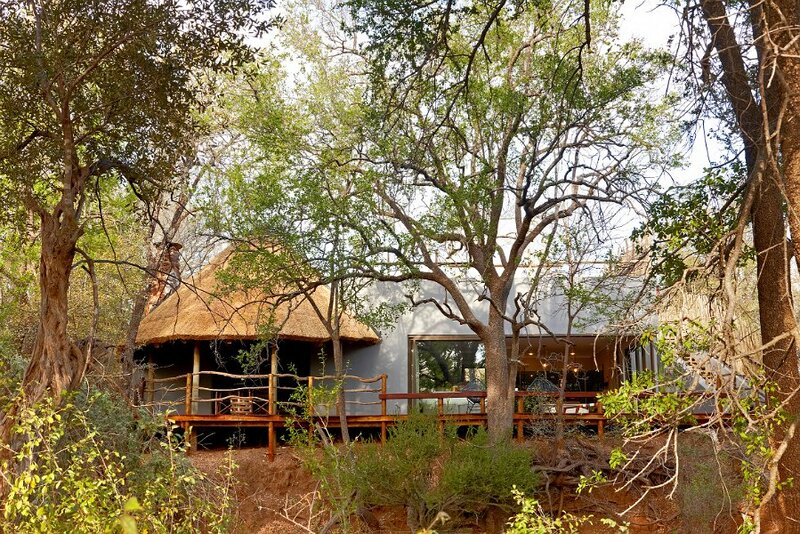 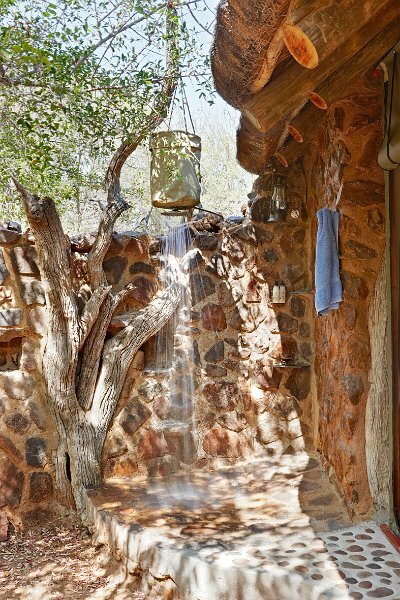 This family-friendly bush retreat is named after the resident buffalo bull that frequents the waterhole in front of it. 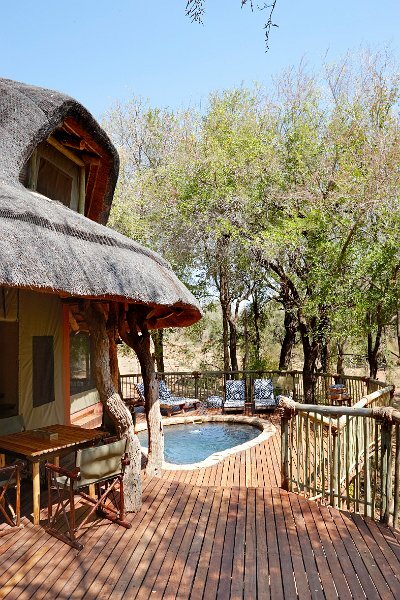 The suite, which accommodates up to six guests, includes a private swimming pool and viewing deck overlooking the waterhole. 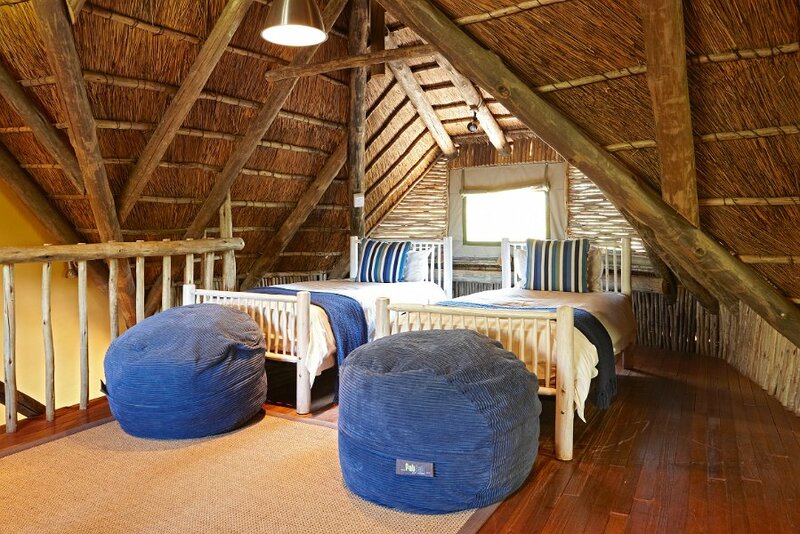 Accommodating up to eight guests, this suite is ideal for larger families or groups. 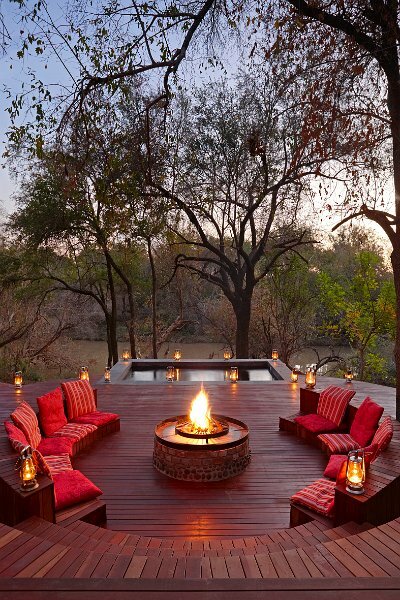 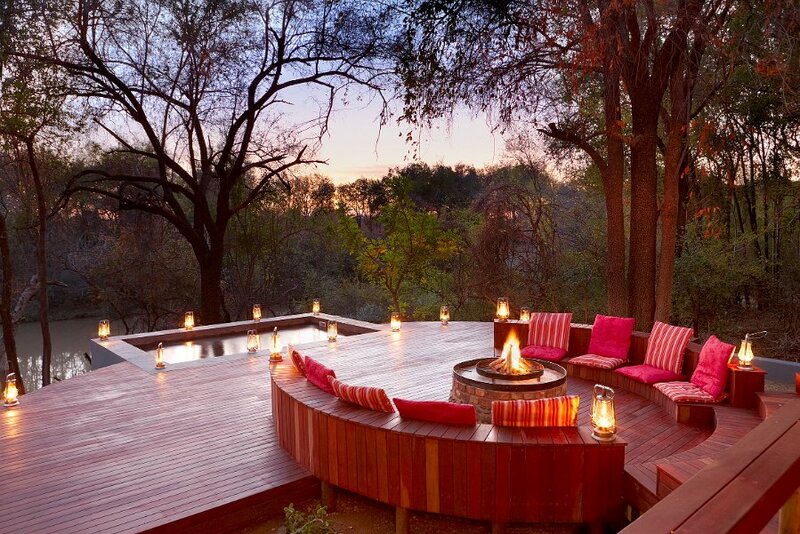 The custom-built deck features a central firepit and spacious seating area leading on to a partially covered ‘star pod’, ideal for stargazing, and a private swimming pool. 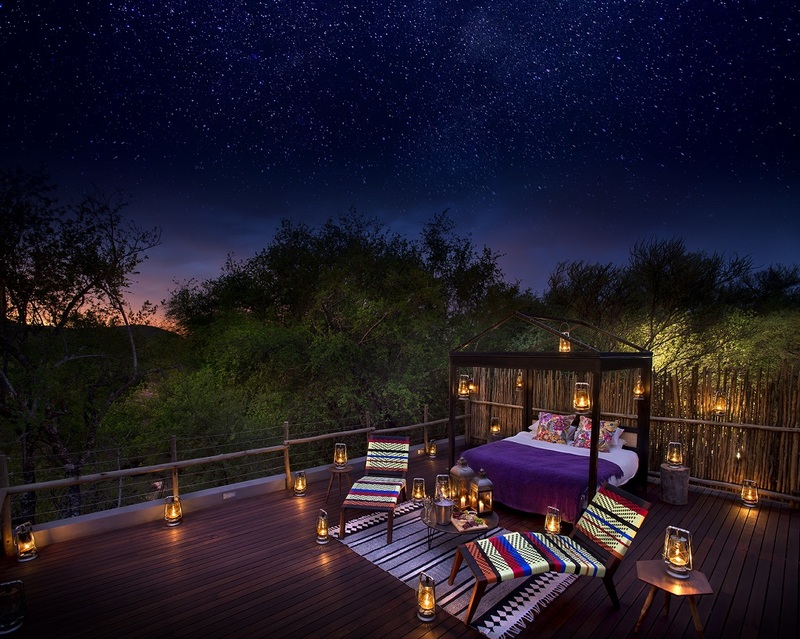 Bushveld romance personified, these two new suites are furnished with bursts of colour and custom-made finishes, with rooftop extensions that afford guests the unique opportunity of sleeping under the African stars. 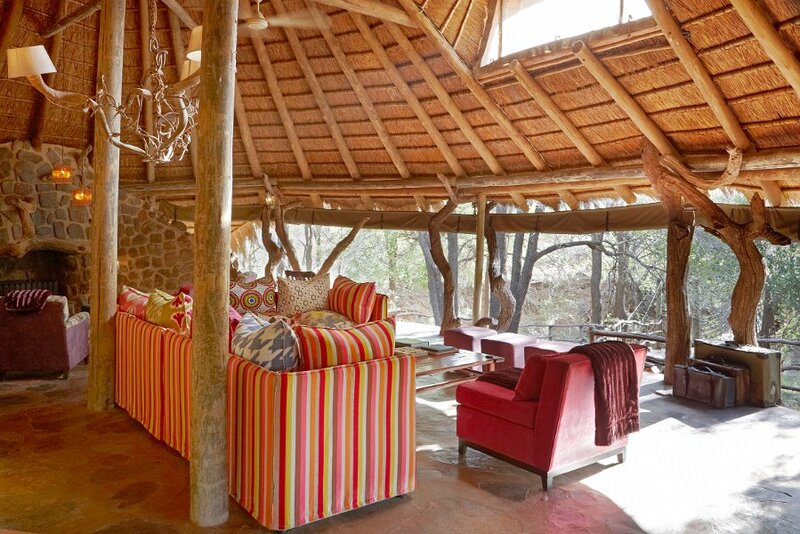 The main lodge building has recently received an extreme makeover resulting in a bold, refreshed, upgraded and spectacular new gathering place. 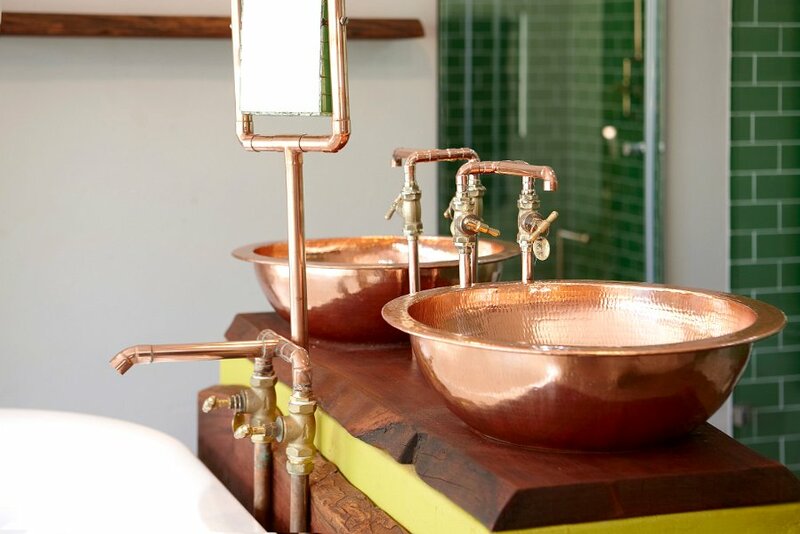 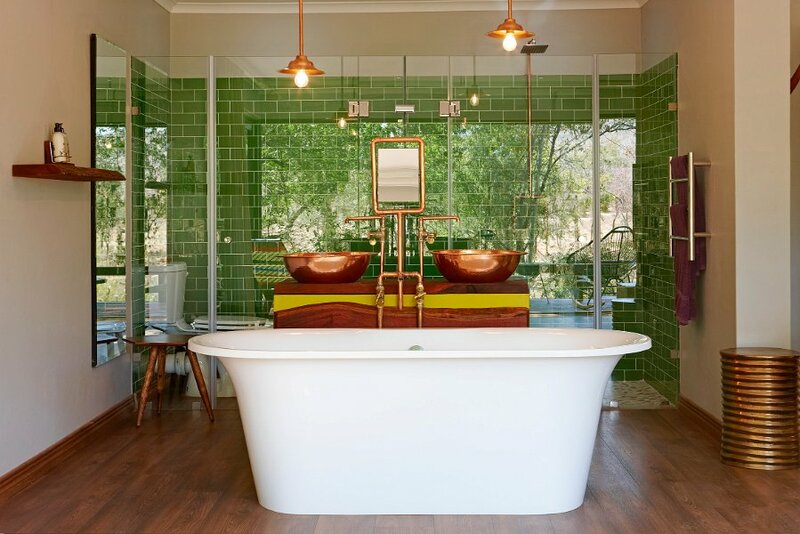 It features a spacious and elegant lounge, a glorious copper fireplace and bar, kitchen and dining areas, all proudly reflecting our trademark striking colourful decor and authentic proudly South African atmosphere. 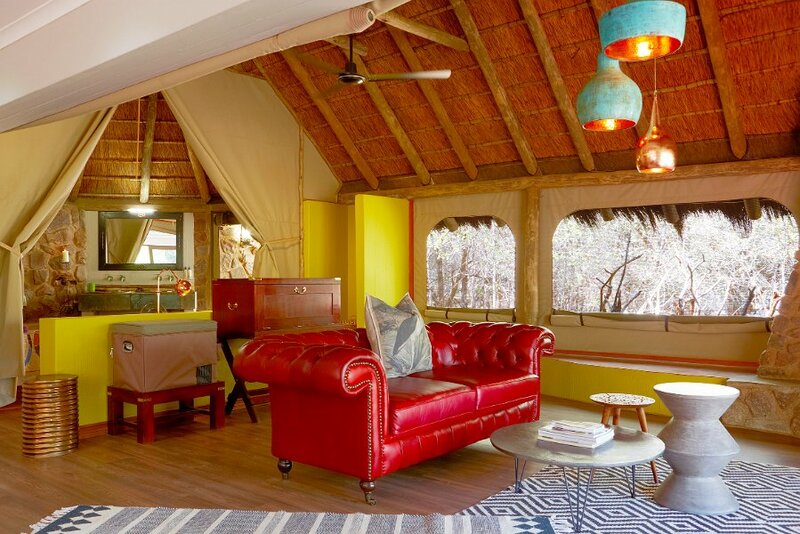 Decorated in vibrant colours and African textures, each of the six double-occupancy safari-tent-style rooms features a private outdoor shower, a lavish handcrafted-mosaic indoor bath and raised private viewing decks. 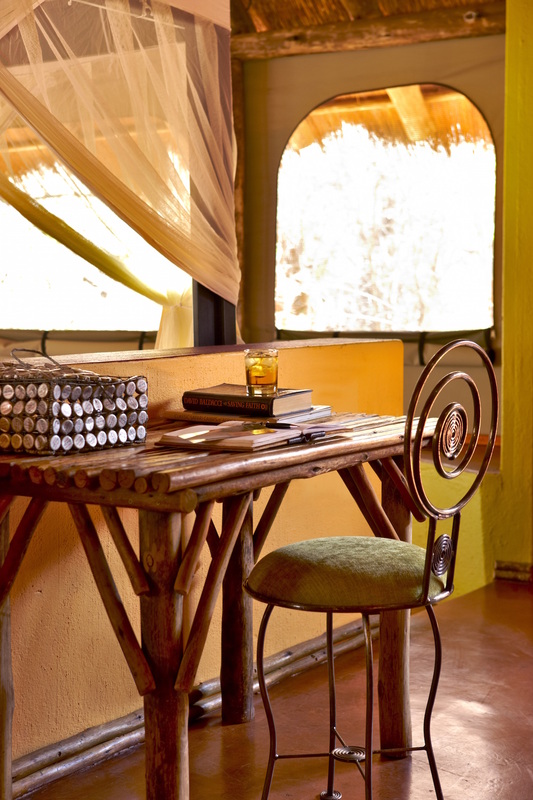 The suites are equipped with air conditioning and ceiling fans. 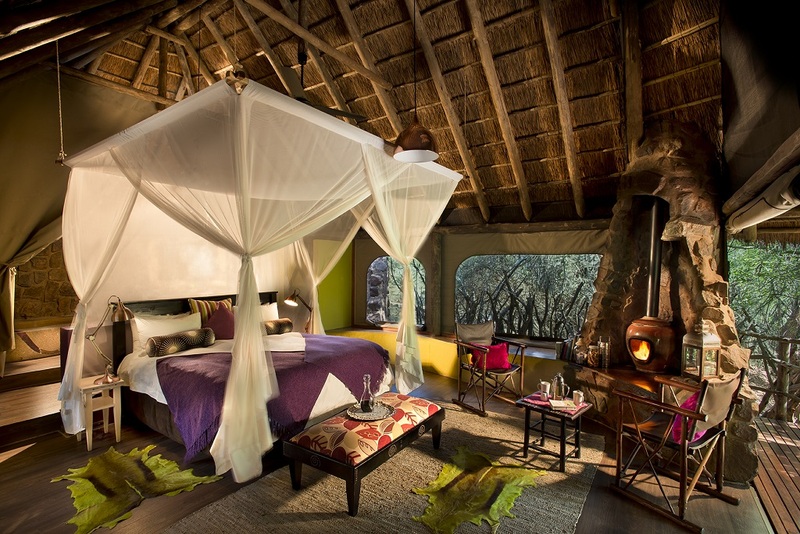 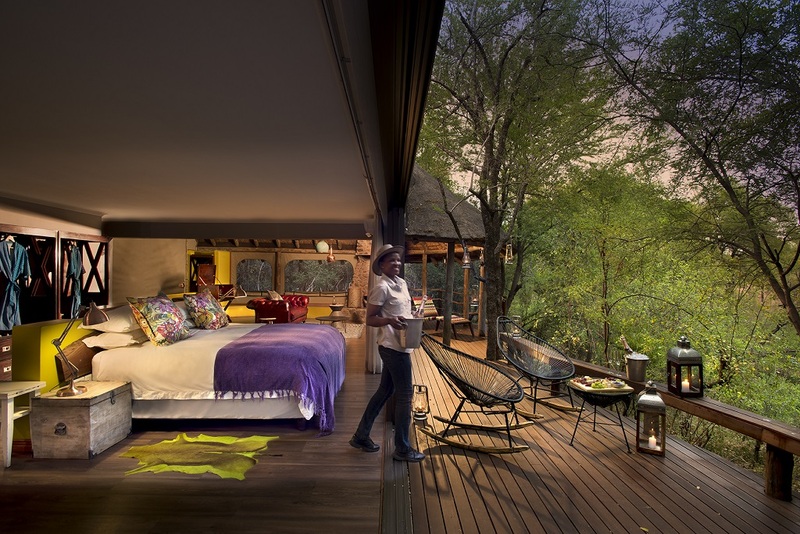 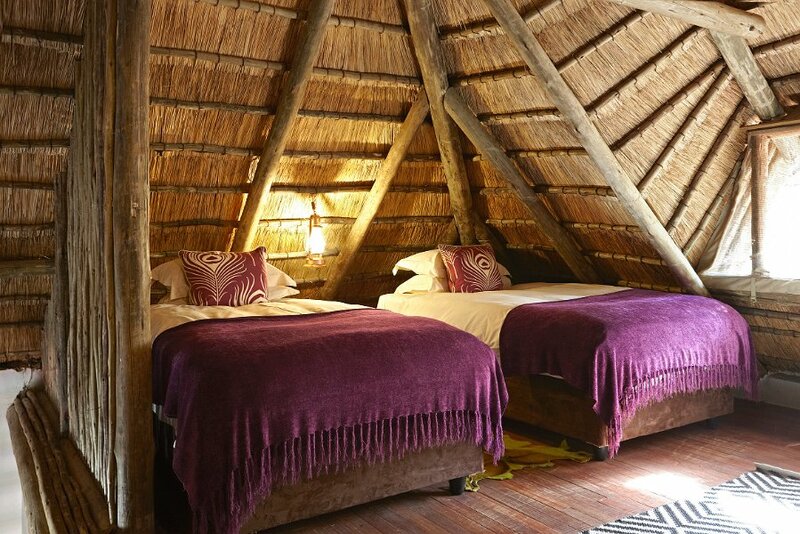 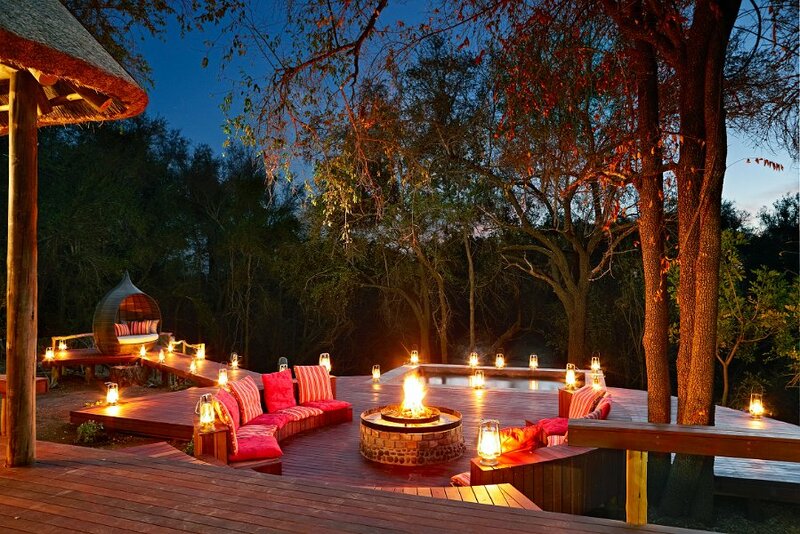 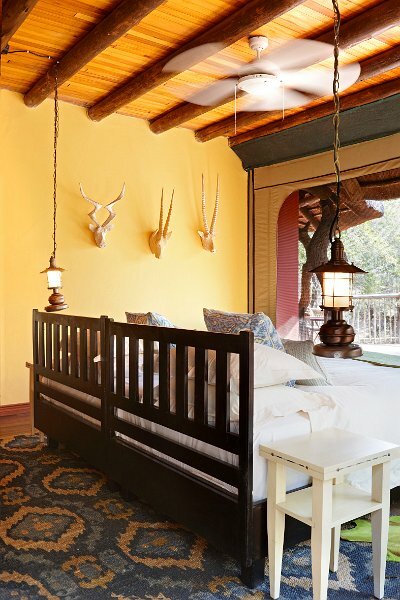 The two new Starbed Suites are the epitome of private romantic safari accommodation. 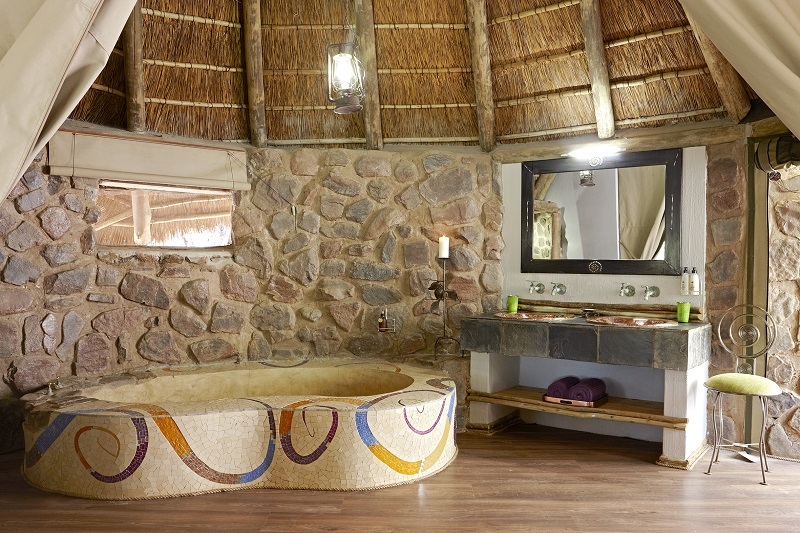 Set over two levels, these luxury suites are ideal for honeymooners and special occasions. 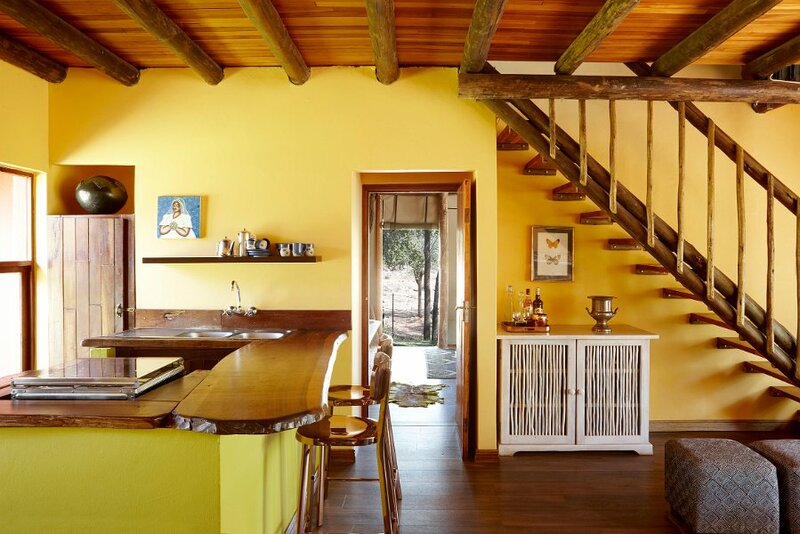 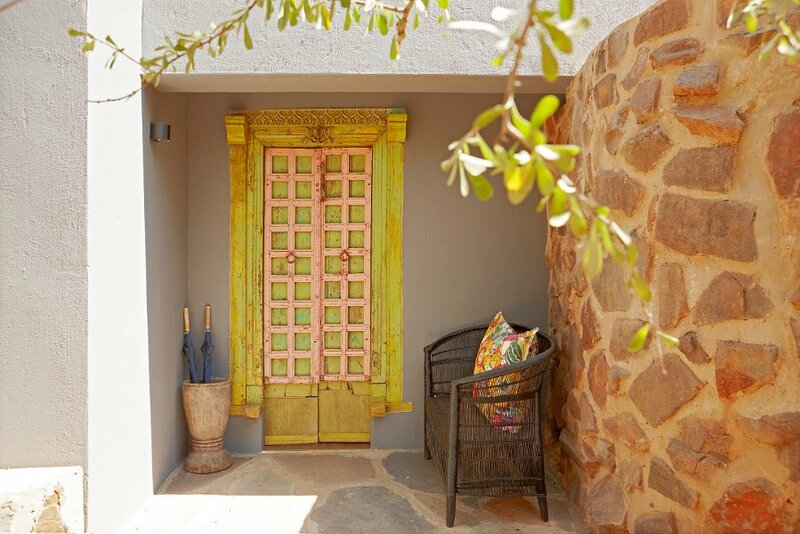 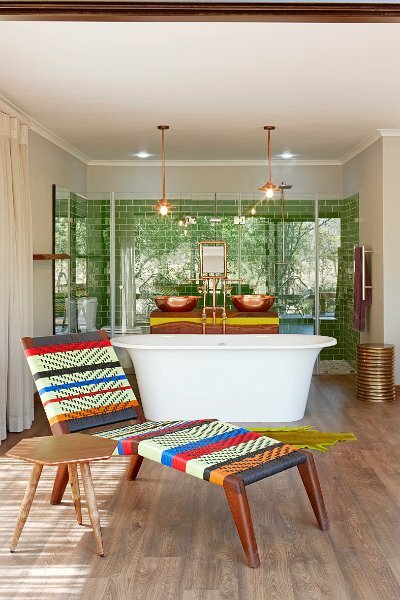 Striking bursts of colour, authentic decor touches, bold furniture pieces and luxurious finishes reflect style, class and sophistication with Jaci’s bushveld twist. 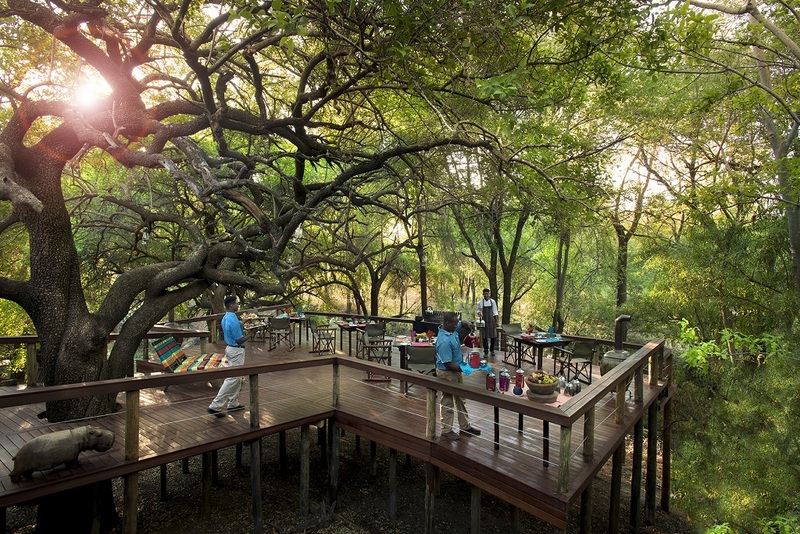 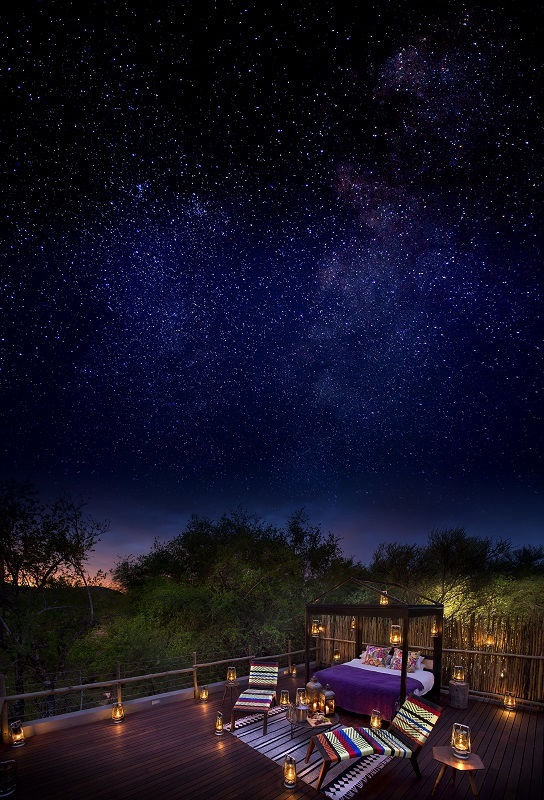 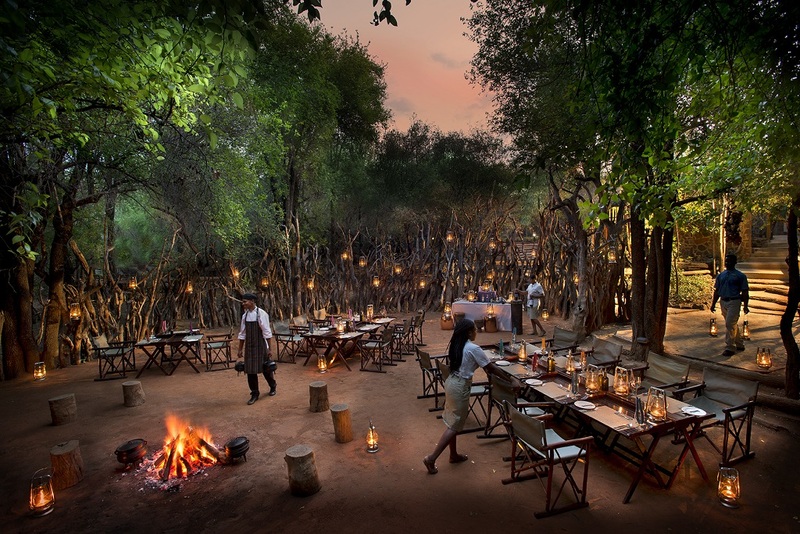 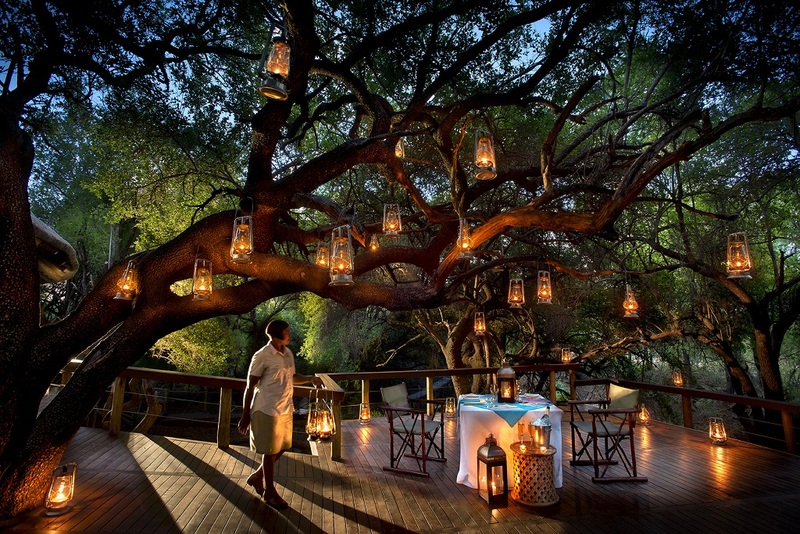 With a choice of sleeping indoors or under the African sky, each suite boasts two king-size beds (one on the roof under the stars), outdoor showers and indoor bathrooms, as well as lounge areas, a private safari bar and viewing deck. 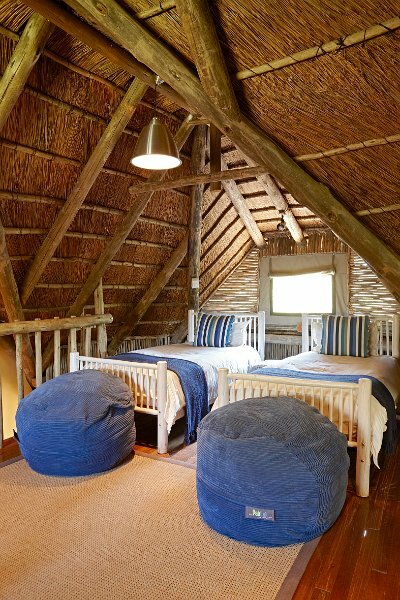 The Nare Suite, which accommodates up to six people (four adults and two children), is ideal for families or groups travelling together. 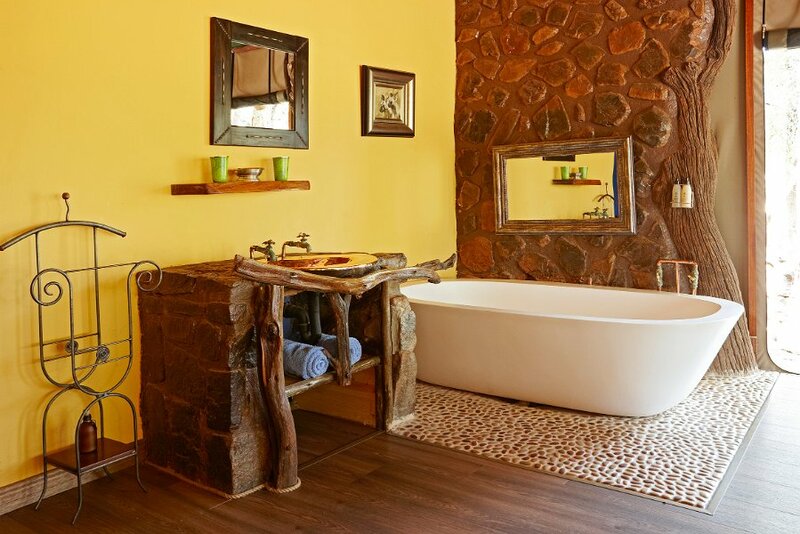 The suite includes a master and guest bedroom, with an open-plan bathroom with a generous stone bath and outdoor shower; and an upstairs loft perfect for children to stretch out and chill. 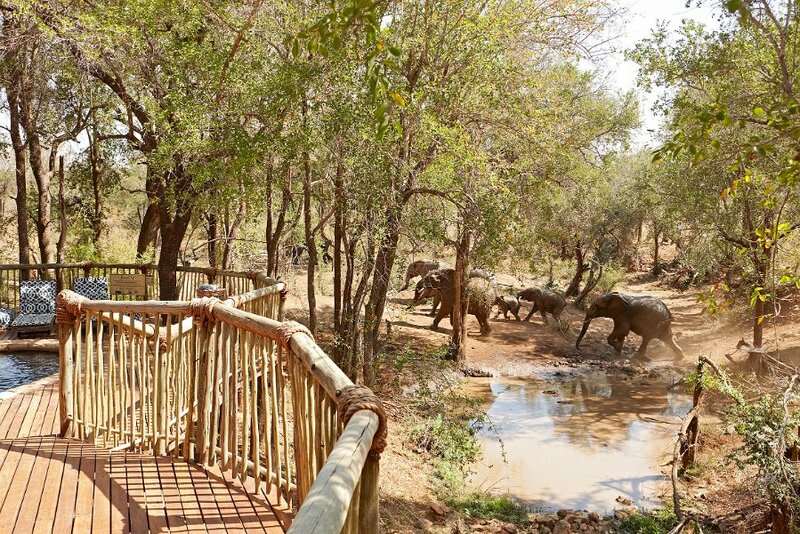 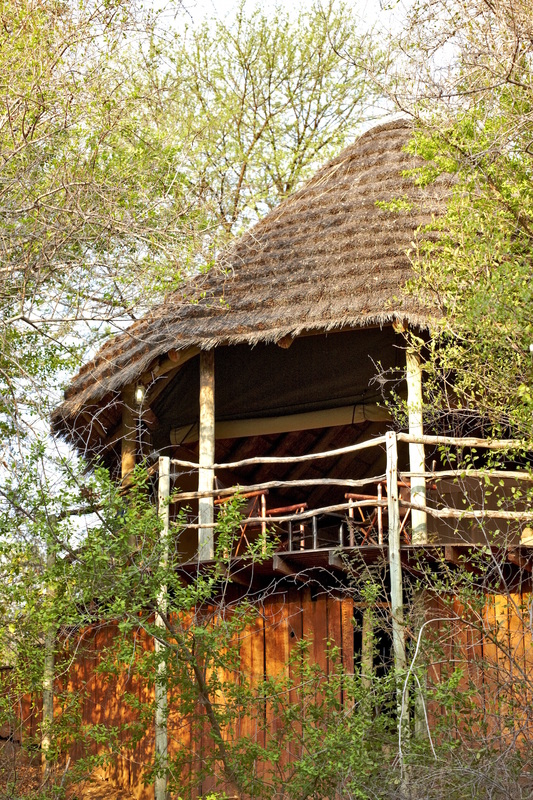 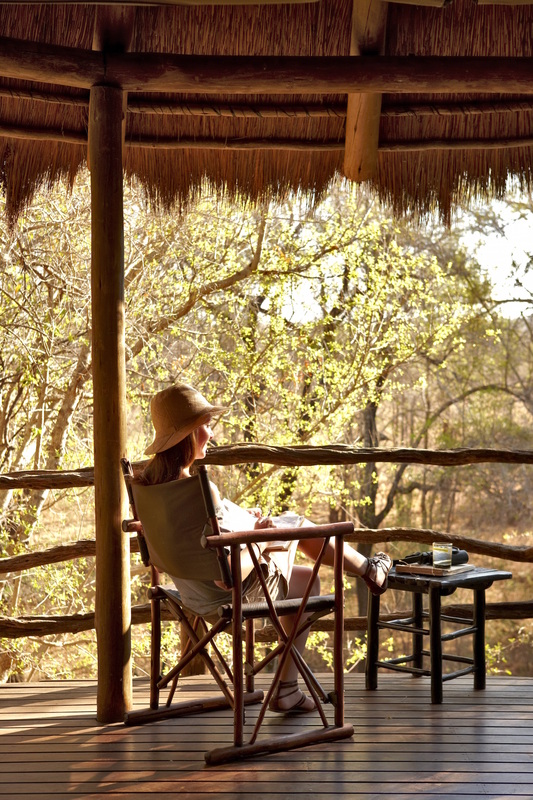 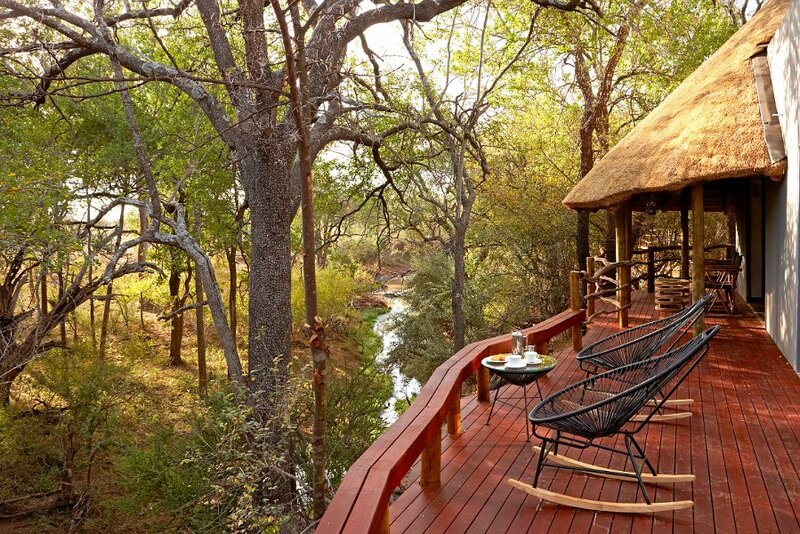 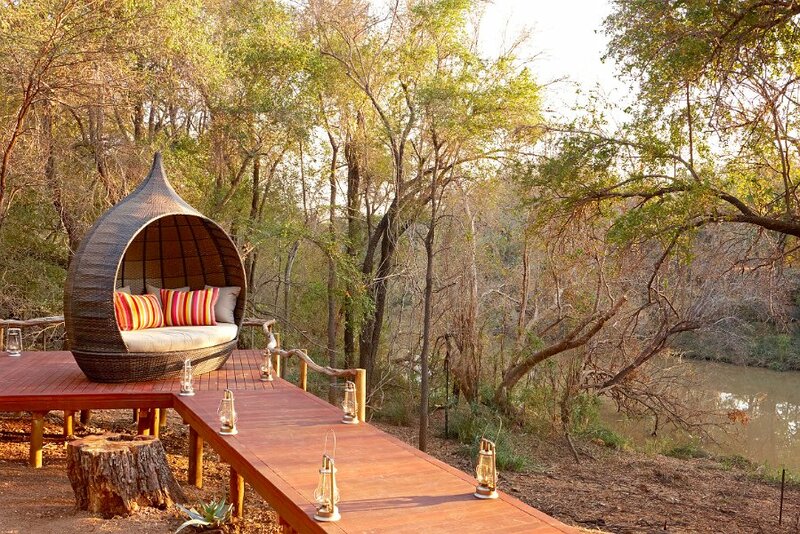 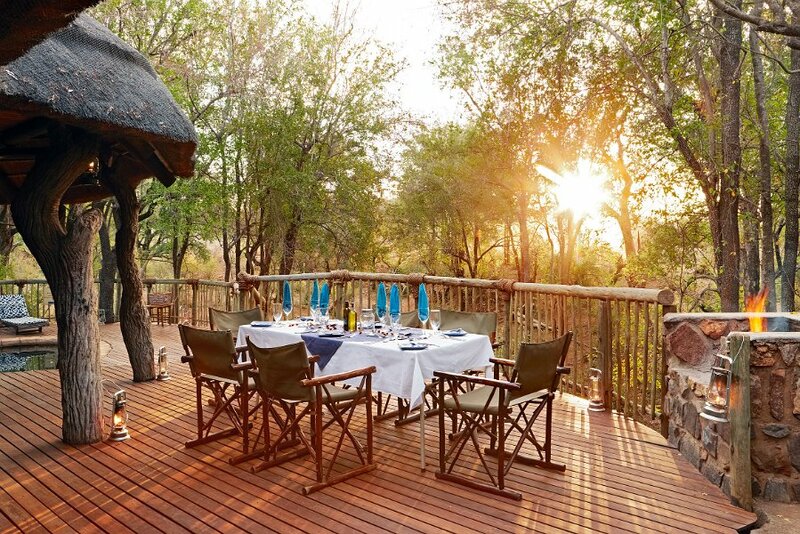 Nare Suite guests have a private game viewing vehicle for the duration of their stay. 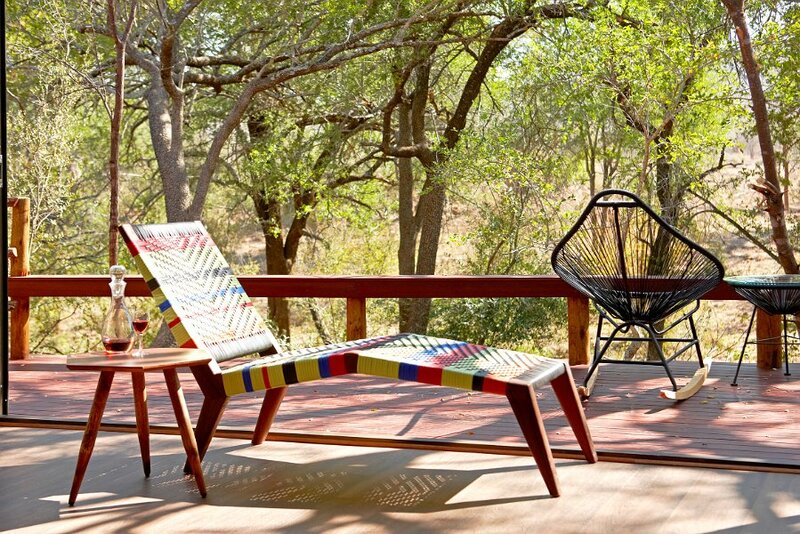 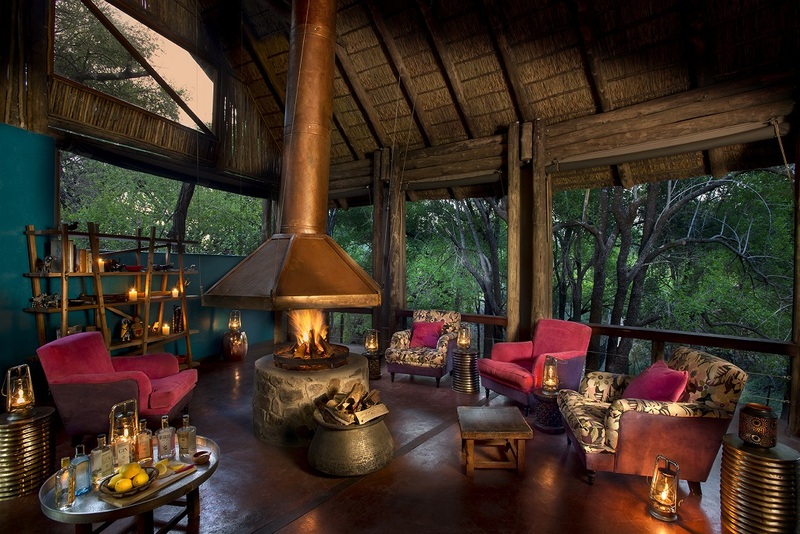 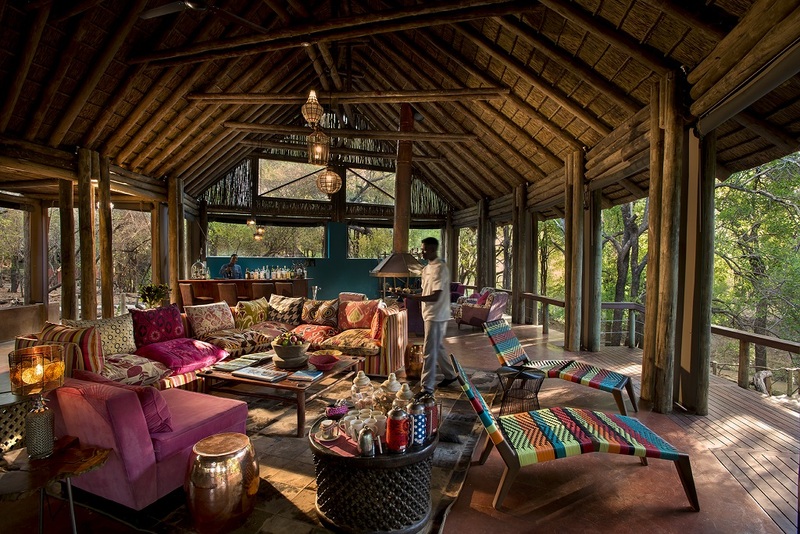 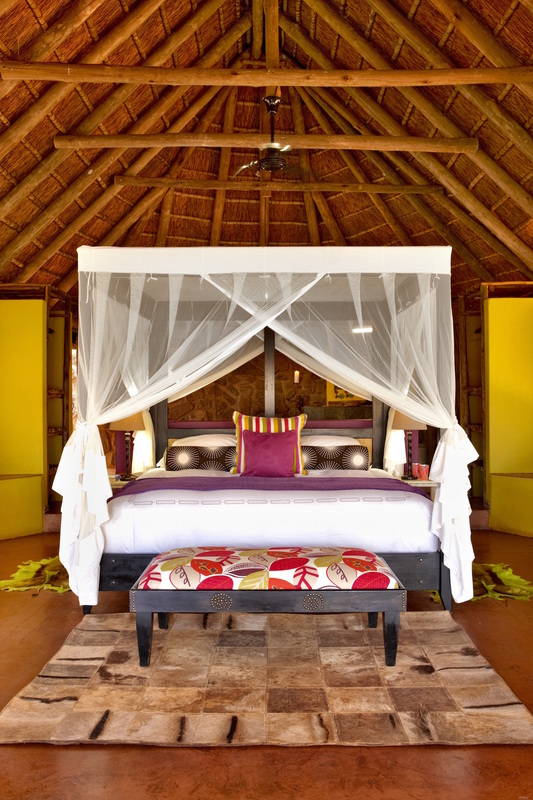 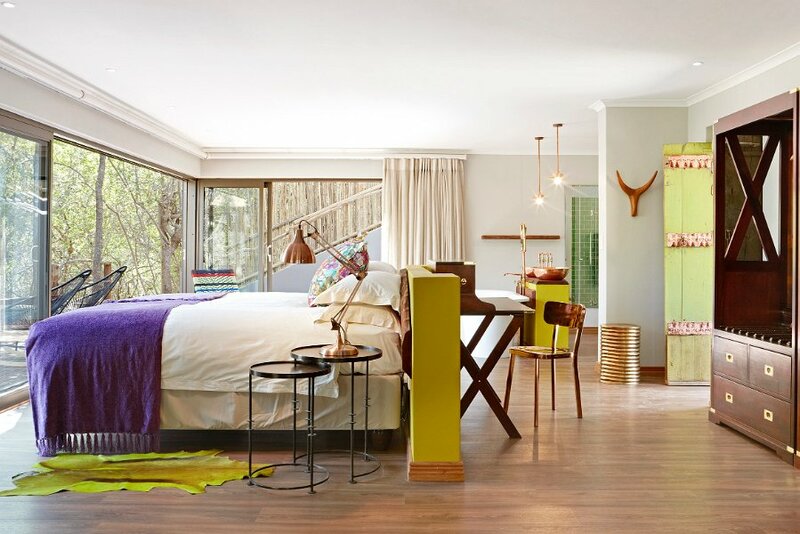 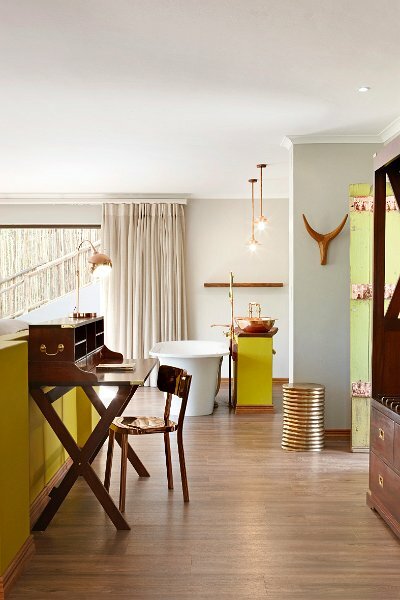 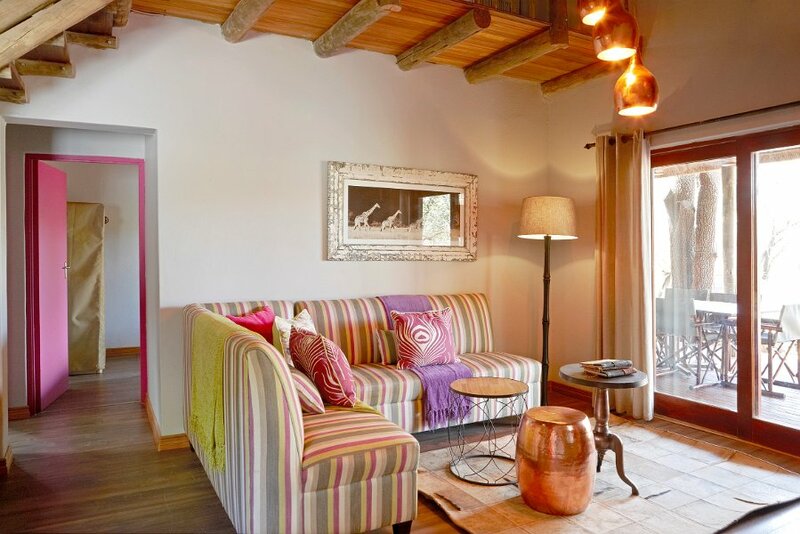 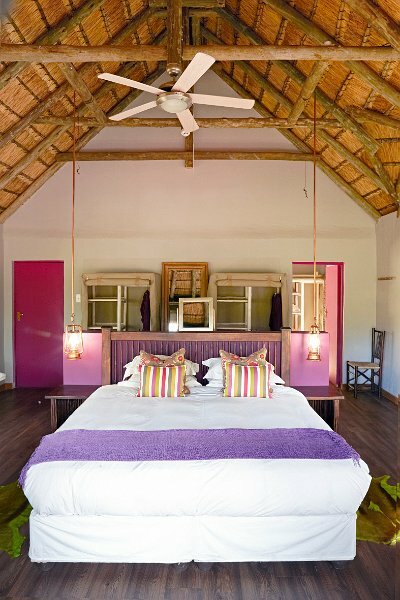 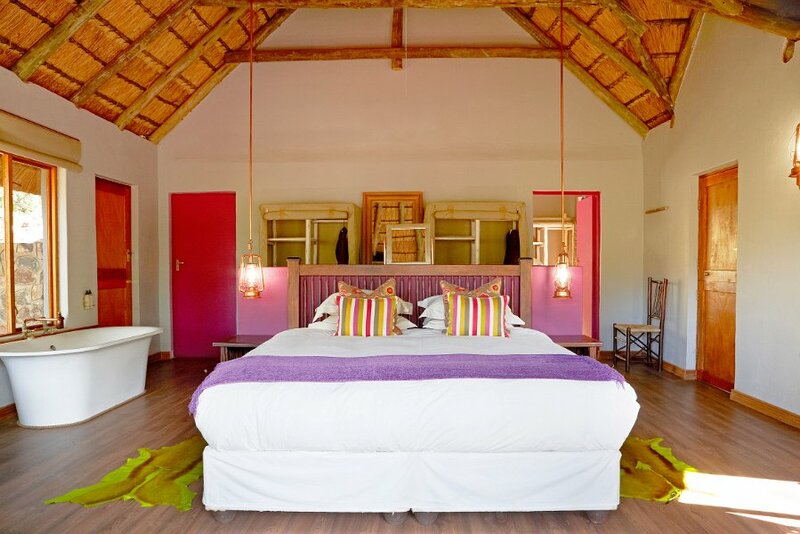 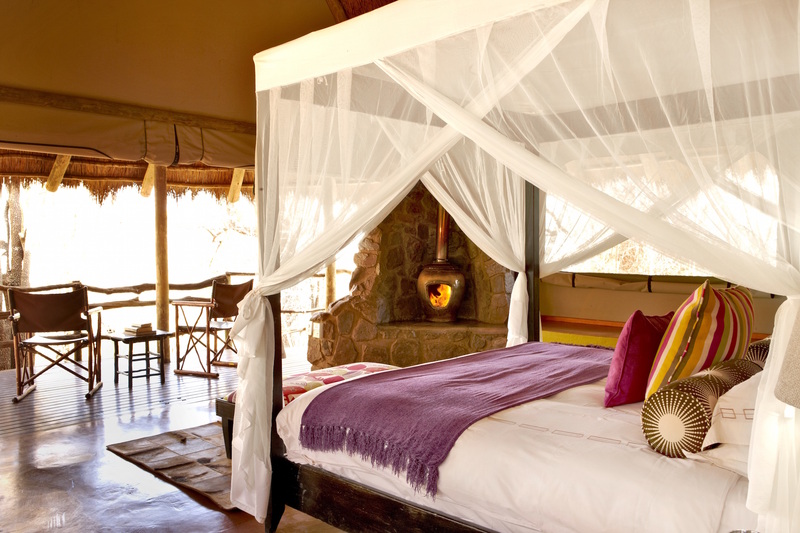 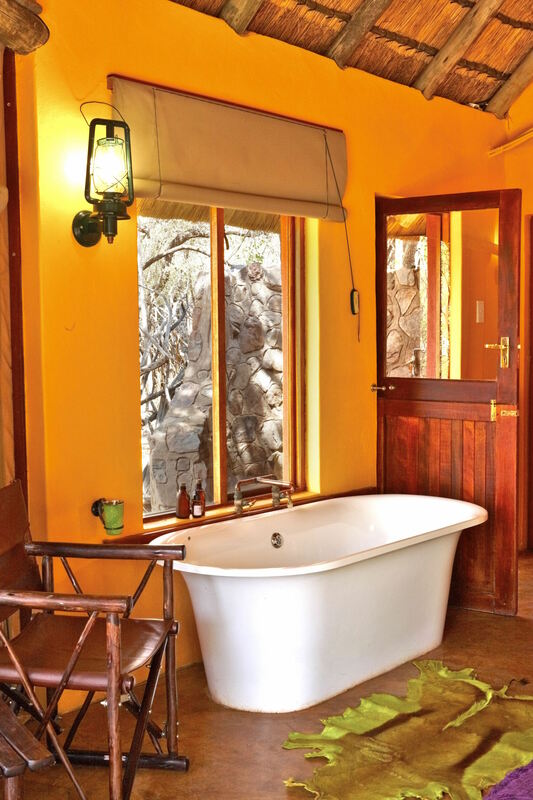 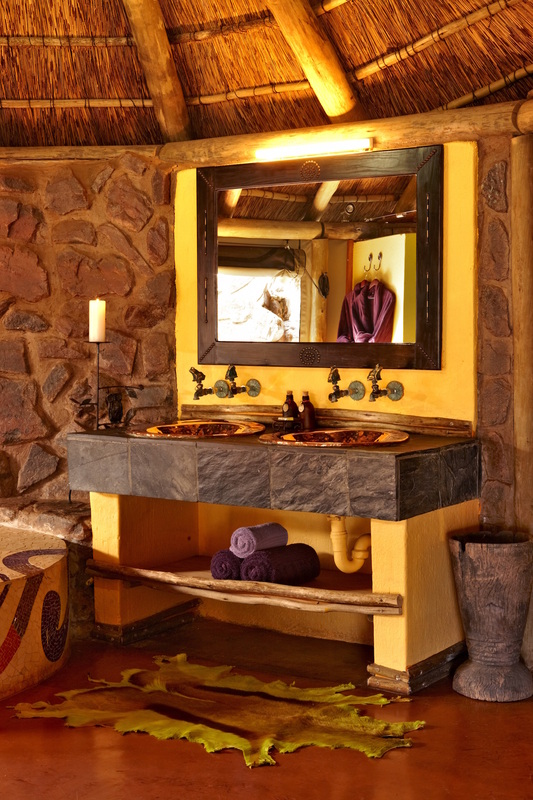 The Safari Suite is decorated in bright, bold colours and African textures. 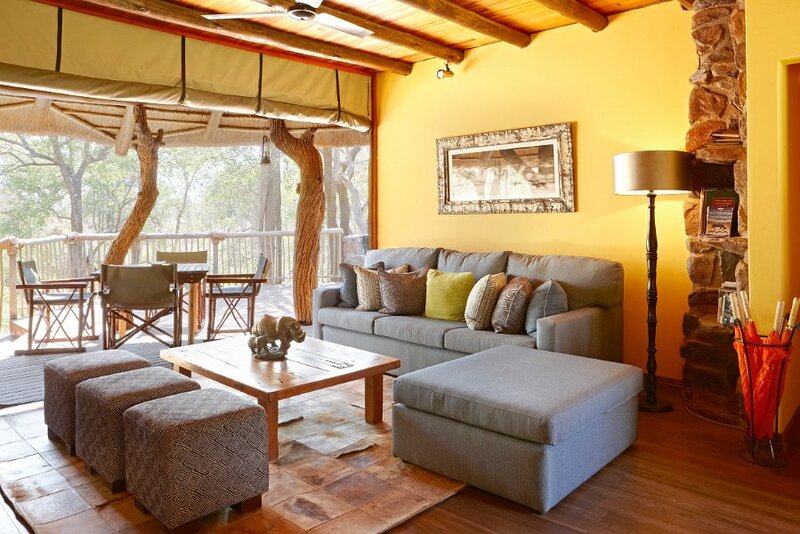 Accommodating up to eight guests (four adults and four children), it’s the perfect safari hideaway for larger families or groups travelling together. 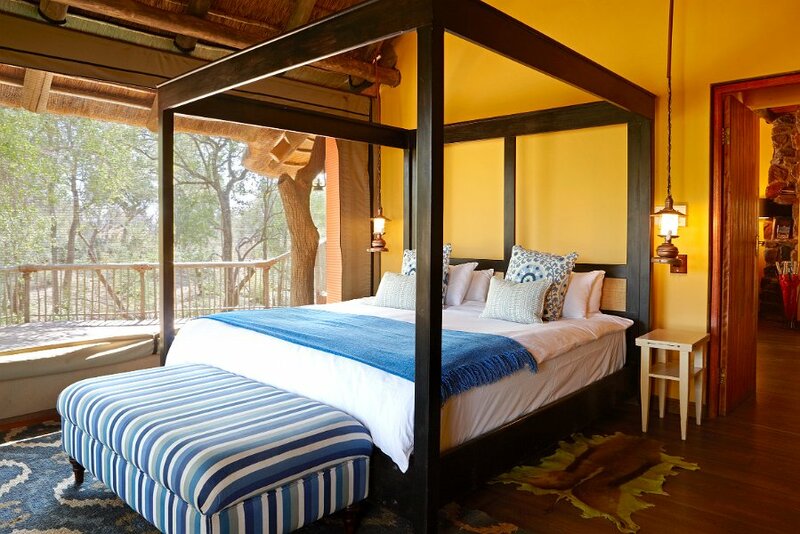 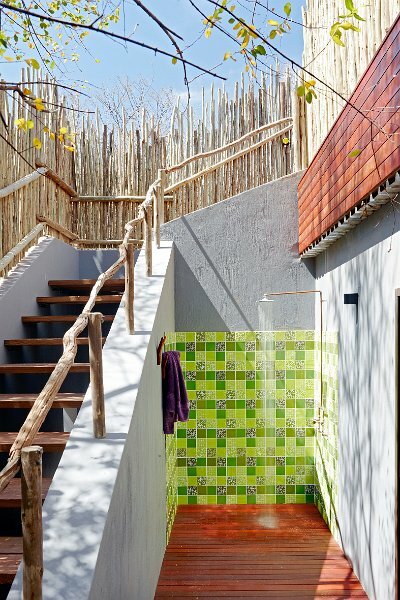 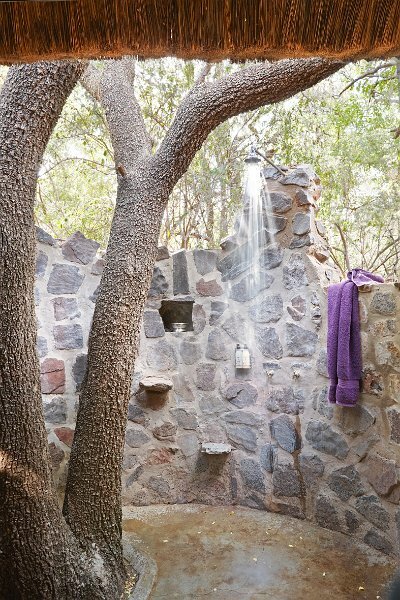 The master bedroom and adjoining children’s room share an outdoor shower and open-plan bathroom with magnificent views into the bush. 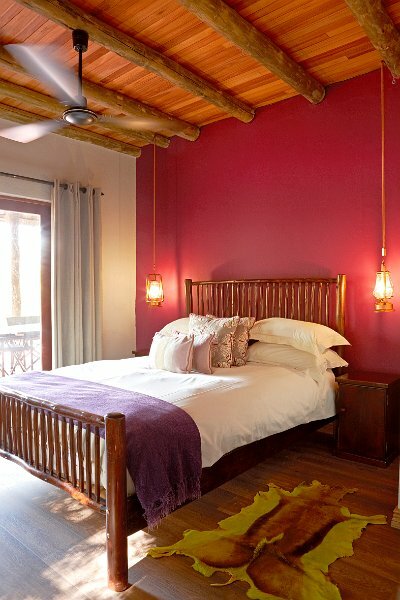 Across the passage there is a lounge with adjoining guest room, and there’s an upstairs loft. 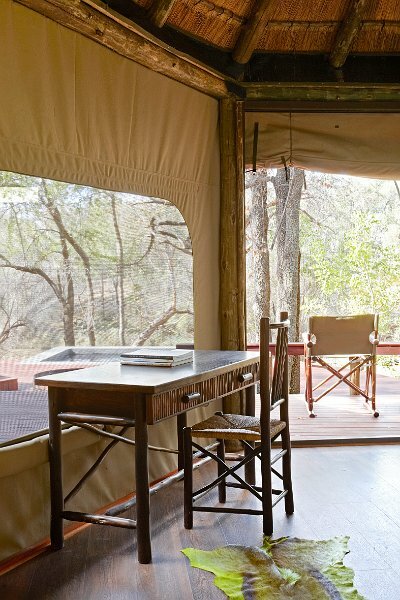 Safari Suite guests have a private game viewing vehicle for the duration of their stay. 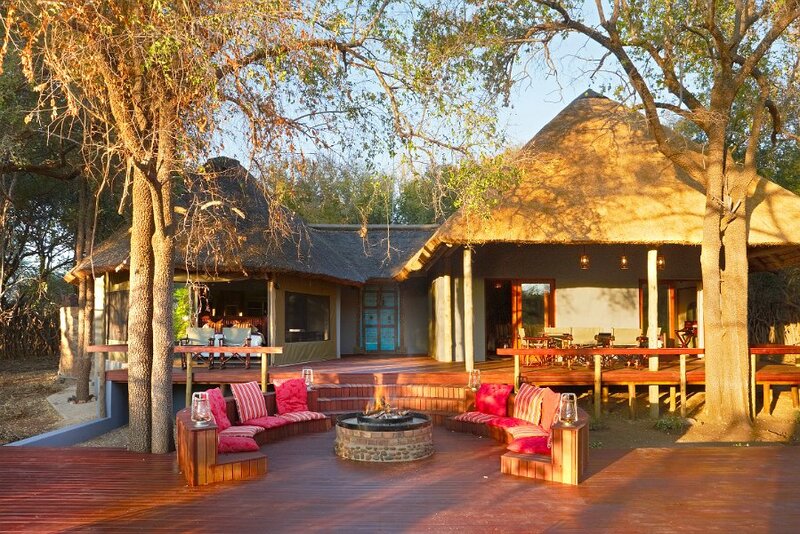 The ‘old’ Main Lodge was the heartbeat of Jaci’s Safari Lodges for 17 years, and has warmly and proudly welcomed a great many guests. 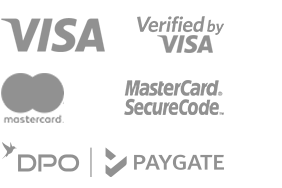 But now it’s time to usher in a new era, and after much planning and anticipation and building, the extreme makeover process is complete! 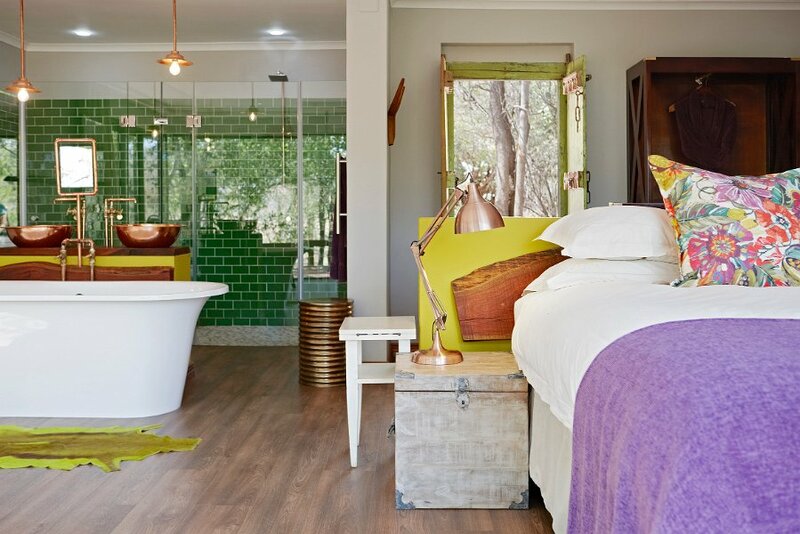 We are so proud of our bold, refreshed, upgraded and spectacular new Main Lodge. 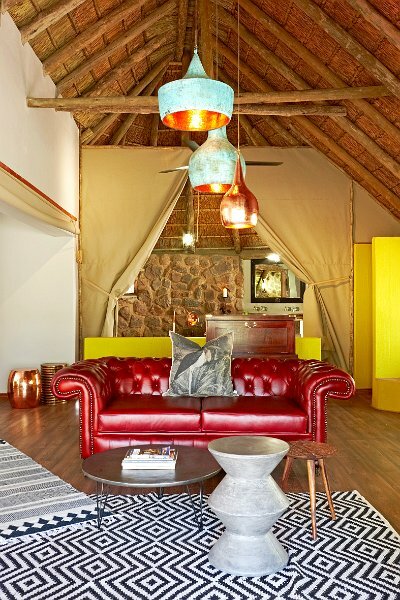 The new building features a new-and-improved lounge, fireplace, bar, kitchen and dining areas, all proudly reflecting our trademark striking and unique decor and authentic proudly South African atmosphere. 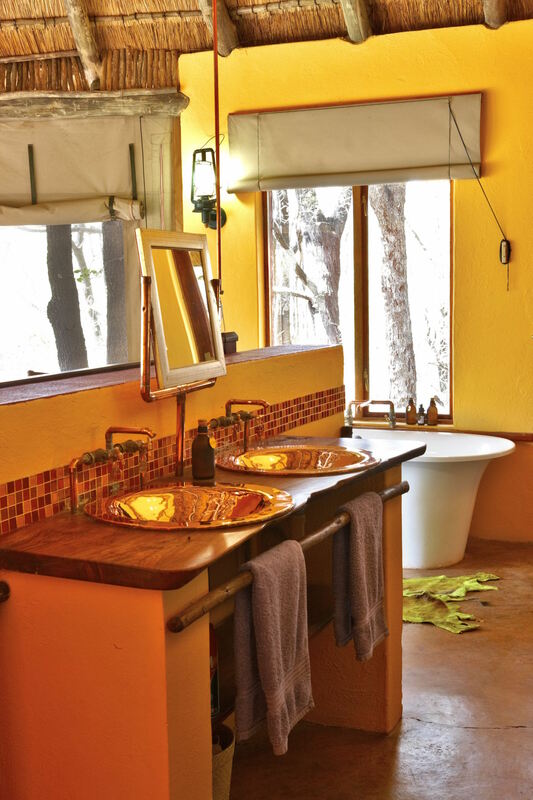 Follow us on Facebook and Instagram to keep up with the more changes as they happen at our constantly innovating and developing lodge!